RT:Peace talks between Afghan officials and Taliban representatives have ended with both sides agreeing to meet again after the Islamic holy month of Ramadan. 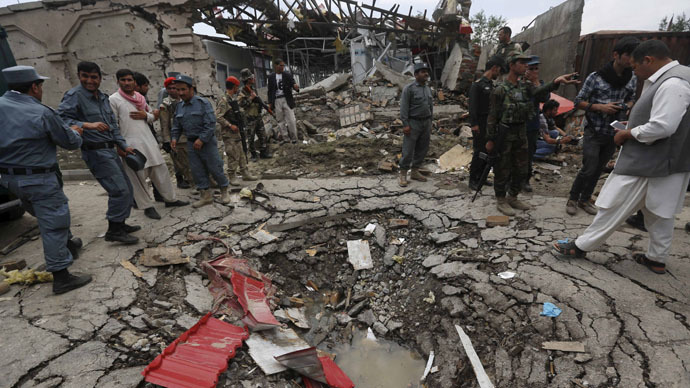 After more than a decade of war the Afghan government and the Taliban are finally talking. Was it worth the thousands of lives lost, both military and civilian? This is a reason why the great powers throughout history have continued to fail because they are led by people who don’t understand that war is not going to achieve an outcome that is regulated, measured or controllable. So in this case, what you are seeing in the talks that are going on now between the Afghan government and the Taliban are really an extension of a process that again has been dating back since the 1970s for one side or another, with the help of outside powers often, to try and have control over all or part of their country. And the tragedy of course is that millions have died, millions more have been wounded and the entire country is a country that is riddled in poverty, chaos, no hope or future. RT:The Afghan President, Ashraf Ghani, declared last week that his goal is to have “permanent peace in Afghanistan”. Will he be able to achieve it? MH: I don’t think it is as long as there are US forces in Afghanistan or non- Afghan forces in Afghanistan. So whether its’ Russian forces, whether it’s US forces, NATO forces, whether it’s Pakistani, Indian or Iranian involvement, as long as - in a nation like Afghanistan where you have a very diverse mixture of ethnicities, religions, classes - you are going to have conflict as long as you have an outside power trying to pick winners and losers in any type of internal conflict or civil war. So for as long as the US keeps troops in Afghanistan, keeps its planes, special operations, drones so they can continue to bomb targets in Afghanistan or Pakistan or eventually bomb targets in Iran, there will be armed resistance to that. So as long as President Ghani continues to align himself with the Americans there will be no peace in Afghanistan. RT:There are deep divisions among the top Taliban commanders regarding current peace talks and many are against them. Is there any hope they'll change their minds? MH: In 2009, when President Obama was deciding whether to escalate the war, there was a large element within the Taliban insurgency… which is very diverse with many different groups in it. There was a large element that wanted to make peace that said: “Hey look, we are tired of 3-4 decades of war now, I don’t want to see my children fighting the same war that myself and my grandfather has been fighting, let’s figure something out”. Of course, the American side at this point was committed to this notion that the Taliban was a terrorist group - the same group as al-Qaeda, that we could not negotiate with terrorists and that we are going to win the Afghan war militarily. The Obama administration wanted a military victory. So in 2009, which when I was serving in Afghanistan, there was no possibility of talks between the Americans and the Afghan government and the Taliban. Now, when the Americans have mostly withdrawn you are seeing elements on all sides realized that was a mistake.But as you said the Taliban insurgency is splintered and most terrifically I think you’ve seen the emergence of Islamic State in Afghanistan.